A new lung cancer drug which is said to stretch life expectancy by a year is being introduced to the NHS. NHS England has approved the use of "Pembrolizumab", an immunotherapy drug, after agreeing on a deal with its manufacturers. 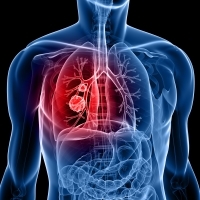 Accounting for 13% of new cases, lung cancer is the third most common form of the disease in the UK after breast cancer and prostate cancer, according to Cancer Research UK. The new drug will be used to treat late-stage, untreated non-small-cell lung cancer (NSCLC) that has spread to other parts of the body. It has the potential to extend the life of those suffering from late-stage lung cancer by up to 16 months. NSCLC accounts for around 85% of lung cancer cases, and in more than half of patients the cancer has spread to other parts of the body by the time it is diagnosed. Only 5% of NSCLC patients, however, survive the condition for more than 10 years, according to Pembrolizumab's manufacturer MSD. After reaching a confidential deal with MSD, NHS England approved the use of the drug - which would have cost £84,000 per patient annually at its full price. It is the first drug to exceed checks put in place in 2017 for new drugs and technology costing the NHS more than £20 million a year. Under the budget impact test, if a treatment exceeds £20 million in any of the first three years of use, the NHS can engage in discussions with the manufacturer to try and manage the impact on the budget. NHS chief Simon Stevens said: "This is another milestone in our rapidly improving modern NHS cancer care. This win-win deal for patients and taxpayers brings genuine innovation and proven survival gains to cancer patients across England." Paula Chadwick of the Roy Castle Lung Cancer Foundation said: "This really feels like the start of something new for us and for lung cancer patients. "Lung cancer kills over 35,000 people in the UK every year and, up till now, funding for treatments, for patient care, for early detection, for prevention and for research has simply not been proportionate to the impact of this disease." Holidaymakers with lung cancer can relax and enjoy their trip with the specific World First insurance package covering them.